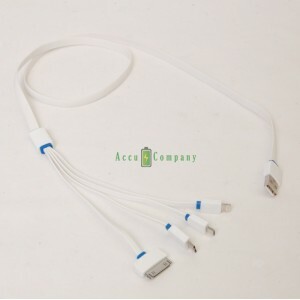 A lightning cable allows you to charge your iPhone, iPad, iPod and Samsung and connect to your computer. It also a includes Micro-B cable (USB 3.0)﻿. This lightning to USB cable of 100cm you can charge your iPhone, iPad, iPod or Samsung and connect to your computer. Also equiped with a Mirco-B connector (USB 3.0). Because the 8-pin Lightning connector is symmetrical you plug the cable lightning never wrong in your phone﻿. Use it to replace your defective lightning cable or extra cable, so you always have one on hand!